The news that the House Appropriations Committee plans to hold hearings on the Orlando Muslim terrorist attack and is also most likely going to throw a lot more money at Obama’s failed homeland security strategy was supposed to reassure rightly nervous Americans that the establishment GOP has things under control. The reality is the exact opposite, and Speaker Paul Ryan’s buy-in to Obama’s Countering Violent Extremism (CVE) strategy is going to get a lot more innocent Americans killed by Muslims. House Appropriations Committee Chairman Hal Rogers (KY-5) said the committee will hold a markup on June 22, by which time more “facts would be available to allow time for careful consideration of any necessary changes that may or may not be needed” to the Homeland Security appropriation. The committee was set to consider a $41.1 billion draft spending bill for DHS that would have denied the department’s request for $50 million intended to provide grants to state and local agencies countering violent extremist ideology. In a draft report released Monday, the Appropriations Committee said the request was being denied because DHS had yet to disburse $50 million Congress gave the department in fiscal 2016 and which are available through September 2017. But here’s the key point no one in Washington will tell you about – there’s no requirement in the bill that the money be spent countering jihad or radical Islam, or even looking for homegrown Muslim terrorists. It’s all about “countering violent extremism,” which according to the Obama administration’s definition could include pro-life groups, limited government constitutional conservatives and even military veterans returning from fighting the actual violent Muslim extremists who have declared war on America and the West. The Office of Community Partnerships at the DHS, the FBI, the Justice Department and the National Counterterrorism Center together operate pilot programs in Boston, Los Angeles and Minneapolis-St. Paul, where local non-profit groups, law enforcement agencies and community organizations allegedly work together to identify and intervene in the lives of Americans at risk of gravitating toward violent ideology. DHS says it is still working on details of how it will choose non-profits and local government agencies to receive grants, and plans to launch the program later this summer, a department official said. DHS Secretary Jeh Johnson has said the program would eventually expand to all the major U.S. metropolitan areas with large Muslim populations that are being targeted for recruitment by ISIS and other militant groups. But here’s what we know so far; the “partners” DHS has identified in the Muslim communities are exactly the same organizations that go on TV after every jihadi attack to say “this has nothing to do with religion” and that Americans “shouldn’t jump to conclusions” about the religious motivations of the attackers. In other words, far from adding clarity to the identity of the enemy what they do is obfuscate the truth about who, what and where we are fighting the war Islam has declared on us. According to reporting by Gopal Ratnam of CQ Roll Call, Congress provided $50 million for a wide variety of counter-extremism programs in fiscal 2016, but how much money is available for what purposes remains murky. Of the $50 million, only $10 million was available to DHS for making grants relating to CVE activities. None of that was directed specifically at attacking Muslim terrorism; it went to the partnership programs that have proven to be singularly ineffective in identifying and stopping individual terrorists. The remaining $39 million was to be set aside “for an initiative to help states and local governments prepare for, prevent, and respond to complex, coordinated terrorist attacks with the potential for mass casualties and infrastructure damage,” according to a Joint Explanatory Statement that accompanied the fiscal 2016 omnibus spending legislation – in other words to respond to another 9/11 sized attack. Why blame this disaster on Speaker Ryan? Donald Trump was right: A singular focus on Muslims as potential terrorists is required to defeat the jihadi threat, and until that’s official U.S. government policy there will be more killings. We already know that Barack Obama has no intention of targeting the real threat – Islam in America. The only person who can stop this folly is Speaker Paul Ryan, and if nothing is done, when the next Orlando, San Bernardino or Chattanooga happens, it will be Paul Ryan who is to blame. 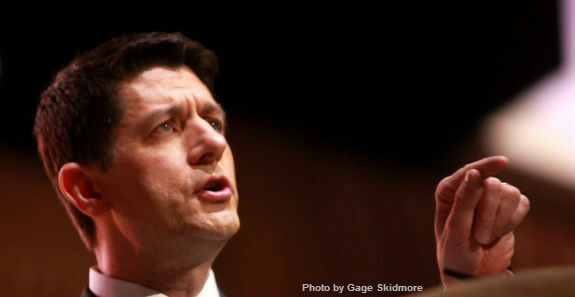 We urge CHQ readers to call Speaker Ryan, the Capitol Switchboard is 1-866-220-0044, tell Paul Ryan it is time to end the folly of Obama’s “countering violent extremism” program and replace it with a robust focus on identifying, interdicting and attacking Muslims who undertake jihad in America. Submitted by b8RYyjCffa on Thu, 06/16/2016 - 17:33. Ryan: if you don't stop obama on sending in more Syrian muslims in this country , so help me you won't be returning Congress any time soon. We see how you are treating us and kissing up to obama and it is going to be stopped by the election of that other guy to congress to replace you. We see what is coming down the road and you better get moving in stopping obama. GOD help you if you don't. With McConnell giving him carte blanc he has allowed obama to pull the ugliest aggression against us so thath is Muslim brotherhood can take over. These B needs to be arrested and thrown in jail. I'm talking about obama and hillary the traitors both. I'm so infuriated by all of you. YOU ARE NOT HELPING IN KEEPING THE AMERICAN PEOPLE SAFE. Don't you dare let that gun ban pass. We are not going to let ourselves be slaughter by the muslims like the are doing over seas. ISIS. We know that they are here. So I suggest you move your arse and get the GOP on board now.!!!!!!!!!!! Submitted by Puddintain on Thu, 06/16/2016 - 11:14. They use the power of the purse to force schools into allowing trannies to use which bathroom they choose. Why not this? Submitted by chaplainpumc on Wed, 06/15/2016 - 07:19. For all practical purposes Ryan is functioning as a democrat. He has a daily soundbite undermining the Republican nominee. It certainly appears that he has not so covertly allied with the democrat party. Submitted by email_registrat... on Fri, 06/17/2016 - 13:02.